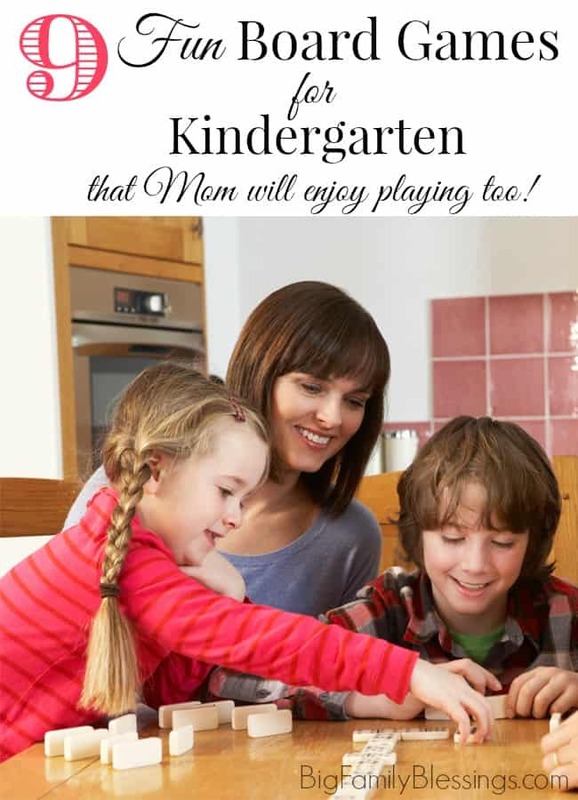 9 Fun Board Games for Kindergarten- that Mom will Enjoy Playing too! My kindergartener’s love language is board games. If we haven’t played a board game together in a few days, she thinks we’ve had no time together at all. I will tuck her into bed and notice her teary eyes. She’ll say, “Mom, when are we going to play a game together?” Often I’ll remind her that we went shopping just the two of us, read a million library books, spent an hour on the porch swing, or baked together. But, for her, those things don’t count. Spend 20 minutes playing a game or two and it was her best day ever. So many of the games available for kindergarten age are mind numbing for an adult. Here are a few games I actually enjoy playing with my kindergartener. Several of them are recommended for older children, but she can play them with very little help. These are the games she brings when bedtime is close, because she knows I’m apt to keep playing without looking at the clock! Sequence for Kids – Create a sequence of 4 matching animals on the game board to win. Sometimes I have to remind my daughter to “play a card, lay a chip, pick a new card,” otherwise she is able to play (and win!) this game independently! Memory – The classic game. Still a great choice for a kindergartener! Connect 4 – This game gets addictive! I get sucked into playing ‘just one more time’ because we have so much fun! Monopoly Jr. – A not too long version of monopoly for younger kids. Not so simple that it is boring though, even my 11-year-old likes to play with us. Rat-a-tat Cat – This is my very favorite. Players try to end up with the lowest score to win. My kindergartener might not know exactly the score she has, but she understands that she should try to acquire the lowest value cards while she plays. Jenga – Another classic, that’s still fun whether you are 5 or 45! Zimbbos – This is a quick and easy balance game for younger kids. Just don’t hope to play it during a younger sibling’s nap! The crash is loud! Go Fish – I loved this game as a child and still love it today. Of course you don’t need a special deck of cards to play, but this set is cute! Gobblet Gobblers – Tic-tac-toe on steroids. What kid doesn’t love tic-tac-toe? Those are my favorite board games to play with my kindergartener. I’m always looking for new games that we can both enjoy playing together. Got any great game suggestions for me?? I’d especially like to hear about Uno Moo. Have you played it with your kids? It’s next on my ‘to try’ game list. Previous Post: « Wednesday Wrap Up – iPhone style. WE love playing Old Maid with the grandparents. My youngest just can't help but shout for joy every time someone frees her of the old maid and we all get a big laugh out of it. Chutes and Ladders is another one I actually like to play with the kids. These are some good suggestions. I recently did a guest post on a blog about our favorite games, and I mentioned Memory too! My almost 5 year old is actually pretty good at it, maybe even better than me. :) Thanks for the great list! Great picks! I loved Memory as a kid, and I'd love to play this with my kiddos someday. And UNO is such a great group/family game! There are a bunch of these I've never heard of, I'm definitely going to check them out! We've found that you. Can't go wrong with Gamewright games (I think I recognize Rat a Tat Cat as one of theirs, though we don't have it). Last summer we bought Mermaid Beach right before our vacation and it was a huge hit -- we've played all year. Others from them that we like for this age are Moose in the House and Maya Madness. I am constantly checking goodwill and used bookstores for this brand. We also like Battleship, Bugs in the Kitchen (a Hexbug game) and Uno. We are game players too! Go Fish was one of our children's favorites!! I think Memory was our all time favorite though. I'm so excited to try the Rat a Tat Cat game. Even the name sounds fun, and I can't wait to play. So many classics here! Easy, quick and bright games are the ones I pick for my little ones. These are a great selection. Great list. Only if my son wouldn't cheat in every game we played. That's hilarious! I have one of those win at all costs personalities around here too! I never thought to play a board game with a kindergartner because I feel their attention span wouldn't allow it. I will have to give Jenga a try. I'm thinking about planning a couple of game days during the summer so this post is perfect! Thank you so much for the roundup of kid friendly games! Pinning to our Summer Fun board! This is a great resource! pinned! My niece enjoys playing connect 4 and memory games. She also enjoys Monopoly, but I don't have the kid version. She also pretty good at bingo. Tic tac toe is also a fun one, we both can get pretty competitive, always end up playing just one more game. My son would adore the tic tac toe game on steroids. This is a great list of kids games. Definitely going to check some of these out. These are all great games. Gobblet Gobblers looks like a blast. *adds to wishlist* My 7 year old loves playing Uno with his great grandma. This is a great list! I had no idea they made a Sequence for kids. I love the adult version, so I'll definitely be checking out the kid one! I was a huge board game fan as a child. I played Operation, Monopoly, Candy Land, Connect Four, and Hungry Hippo for hours. Board games are a great way to keep families engaged when the weather is too hot or cold. These games bring back such fond memories, especially Go Fish, memory, and Connect 4! So glad I read this just before our beach trip in a few weeks with my little ones. While my kiddos aren't Kindergarten age yet, some of these are great games preschoolers can play. My kids love Memory! They can literally play for hours back to back.